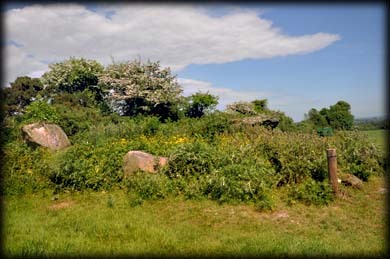 Newbawn Portal tomb is one of just two monuments of this type in county Wexford. Sadly this tomb is in poor condition. As I was in the area I decided to drop by. This was the wrong time to visit as the tomb was covered in thick vegetation. I would suggest a visit during the winter months maybe more fruitful. According to the National monuments record it consists of a large roofstone resting on two collapsed portal stones, two sidestones and a split backstone. 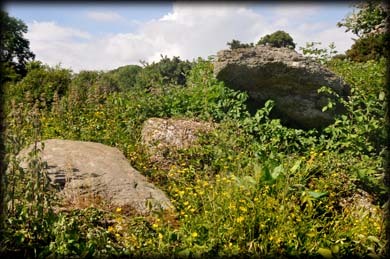 The boulders in the foreground of the image below are more than likely field clearance. If I am near this location during the winter months I will try to get more detailed images. From the west, the roofstone is right of centre. Situated: From New Ross head east on the N25 for about 10 kilometres. Then turn right onto the R736, after 4k turn left onto the R735. Then after 1k turn right onto the L8060. The tomb is 500 metres down here on your left. It can be seen from the farmgate. Ask at the local farm for permission. Discovery Map 76. S 8293 2155. Last visit June 2016.